From the Teenage Mutant Ninja Turtles to Finding Nemo, turtles have a reputation in Hollywood of being crass or stoned. As ever, it’s up to a foreign film to redress the balance. This French-Belgian-Japanese co-production from Studio Ghibli follows a castaway who encounters a giant red turtle. Although this doesn’t look like a Ghibli movie, it feels just like one. Humanity, fantasy and ecology ripple through the film – and without a single line of dialogue, a picture shells a thousand words. The beautiful hand-drawn animation and Laurent Perez del Mar’s gorgeous music combine to create a dreamy, emotional effect, drifting wordlessly through the tranquil imagery of the Grateful Dead’s ‘Terrapin Station’. All 80 minutes of it. Dutch-British director Michaël Dudok de Wit observes nature so beautifully, his vision seems to connect on a primal level. It’s a film you can let wash over you, or crack open its shell to find some sort of basic sense being made out of life. In a time of such constant noise and distress, this quiet, meditative picture is a cool island of calm in a sea of idiocy; the film equivalent of listening to Brian Eno in the bath. Terry Pratchett imagined a disc-world balanced on four elephants standing on the back of a giant turtle. 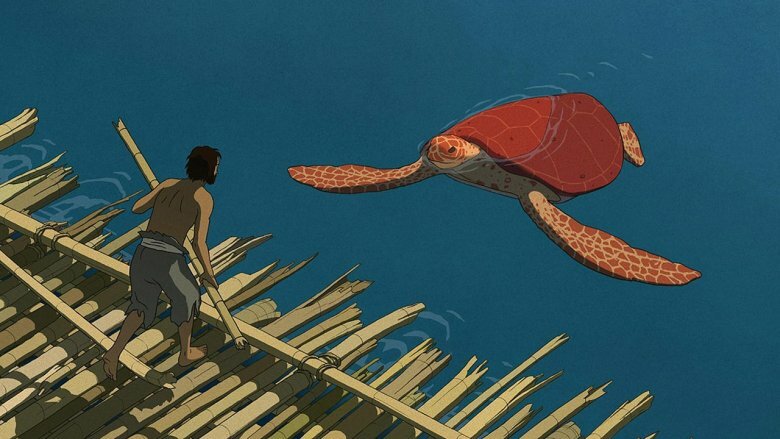 This boundless, mystical reputation is duly restored in The Red Turtle; a film characterised by the turtle’s calm, peaceful exterior and ancient, silent wisdom. It’s turtally wonderful.